Corporate eLearning Strategies and Development: Should we TWITTER Face-to-Face? The Read Write Web recently posted about how Zappos.com has been using Social Media. "Of all the different types of social media the company uses, none are as interesting as its use of Twitter. Twitter may sound cliche, but it's not just about Twitter as one single service. Twitter is symbolic of rapid, short, synchronous and public conversations. Zappos has bitten off a big chunk of that paradigm." There's been an interesting conversation about social media conversations over at the eLearning Technology blog. I know Tony believes in the power of social media, but I don't think he feels the Twitter-love just yet. 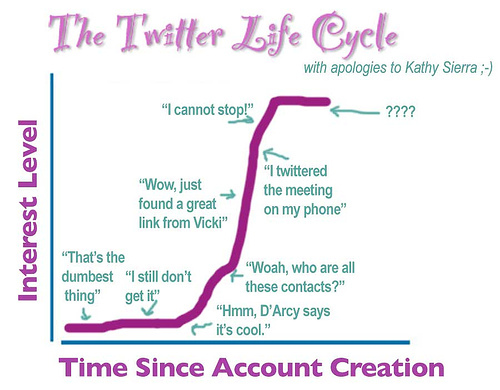 The cogdogblog has this image on the TWITTER life cycle and some GREAT commentary around its use. 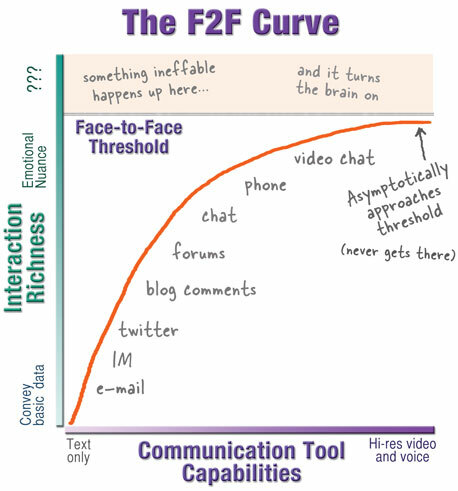 And back in March of 2007 when Kathy Sierra was still blogging she had this great post: Face-to-face Trumps Twitter, Blogs, Podcasts, Video... and in it she offers the F2F Curve. "The point is, face-to-face still matters. And in fact all our globally-connecting-social-networking tools are making face-to-face more, not less desirable. Thanks to the tools y'all are building, we now have more far-flung friends--including people we've never met f2f--than ever before. We now have more people we want to connect with in the human world, often after years of electronic-only contact." I hope everyone will begin to understand that it is NOT an either/or discussion we are having. F2F interactions are important and crucial to us as human beings. However, one cannot deny that the new breed of web tools support our addictive nature to connect with others of our species. And for conferences? The web tools are still important as they begin to help us gather together (or cluster) more easily with the ones we want to meet and serendipitously with others. How many times have you written an email AFTER a conference saying, "geez, I'm so sorry we didn't find each other"...while we BOTH were at the show. Social media tools like Flickr, Facebook, Twitter, blogs, etc. enhance our connectivity for many reasons at many different times. If you choose NOT to participate that is okay too. 5 is not worse than 500 if the 5 connected "friends" are the friends you WANT to be connecting with. Let's try not to tie up all these new technologies with a neat little bow. They are new and that's it. We are all experimenting and trying to figure out how to use them to our advantage. Great points. To me, the point is about connectivity. We are richer individuals when we connect, regardless of the tools, means, locations, etc. Web 2.0 tools have helped me to connect with others in ways not possible before, helping me to share with and learn from others, as well as make new real-life friends. I still love F2F conferences and meetings, but am grateful to have new tools in my network kit. And honestly, I'm not exactly sure who sounded the alarm that all f2f interactions were going away. It's crazy. I believe the new tools make that need/desire to connect "live" even stronger. Live events become MORE necessary, not less, as our ability to connect globally increases. Brent - Great post. I've always been a big fan of the F2F experience and couldn't agree with you more that it's becoming more and more important as we wade deeper into the social media pool. BTW... I saw Kathy Sierra speak this year as SXSW and all I can say is "wow." Run don't walk to see her if she presents live again. Hi Jim! Thanks for the kind words. I thought Kathy went off the grid? I'd love to have her speak at DevLearn or Annual Gathering. Glad to hear she's willing to get back into the mix. Th new tools of interaction is a relatively recent phenomenon, good or bad will be known over a period of time, but nothing to beat it when you want to network with like minded people whom you have not met, or would have got an oppurtunity to meet in conventional face to face interaction, this possibility open new vistas of collobaration in our field of interest. This could also be a great tool to enhance the face to face meeting, being a precursor for greater interaction. Brent - I have no idea why this post just recently showed up on my feed. I'm late to the party I suppose. Regardless, there are some great points here. In the various talks I give on integrating social media/building a personal brand online, I make the point that I believe F2F communication is always our ultimate goal. For some folks, myself included, it is easier, more expedient, and in some cases, more comfortable to make acquaintances online before F2F. 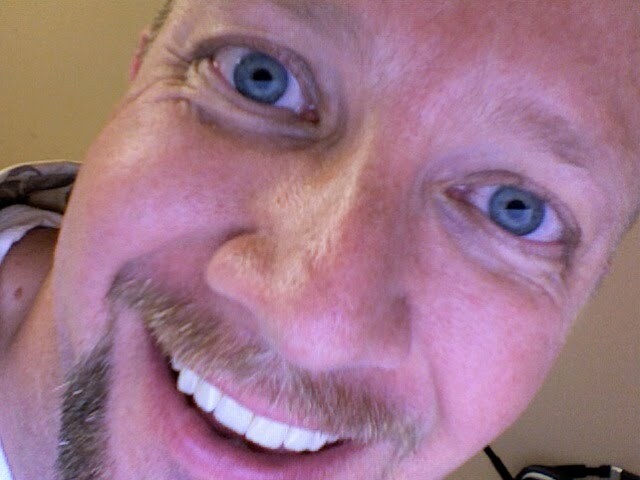 I admit I've found jobs and contacts through Twitter, as well as good friends who became better friends once we had a "tweetup." Human beings will always crave the companionship of others. The computer can't replace that. It can just provide another way of reaching that goal.